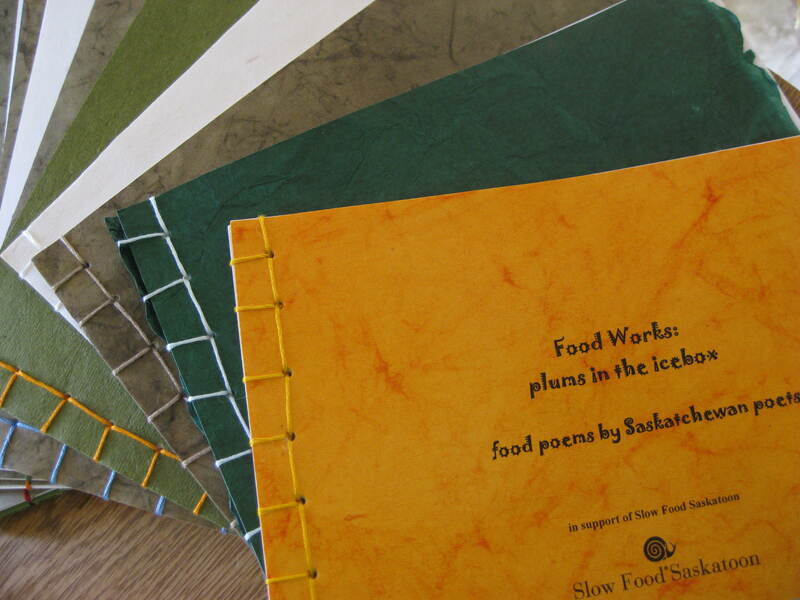 Food works: plums in the icebox is a handcrafted chapbook hand-stitched and bound with Japanese stab binding. It celebrates National Poetry Month, and contains food poems by 23 Saskatchewan poets. A limited edition of 75, each numbered, was produced as a fundraiser for Slow Food Saskatoon, by dee’s small press, Dogpatch Press, with the helping hands of “free-range elves” who assisted with the stitching. A second print run of 50 was assembled and lovingly stitched into life after the first print run sold out: four copies of Food works were purchased by Slow Food founder Carlo Petrini!